The twinned letters on the Capitol’s collective lips this month are C and R. Together they stand for “continuing resolution,” the colloquial name for legislation that keeps money flowing to federal programs whose regular spending bills are unfinished. Anywhere from two to 21 of these stopgap measures have been required in each of the previous 19 years to maintain regular operations for some time in most, if not all, agencies and departments. 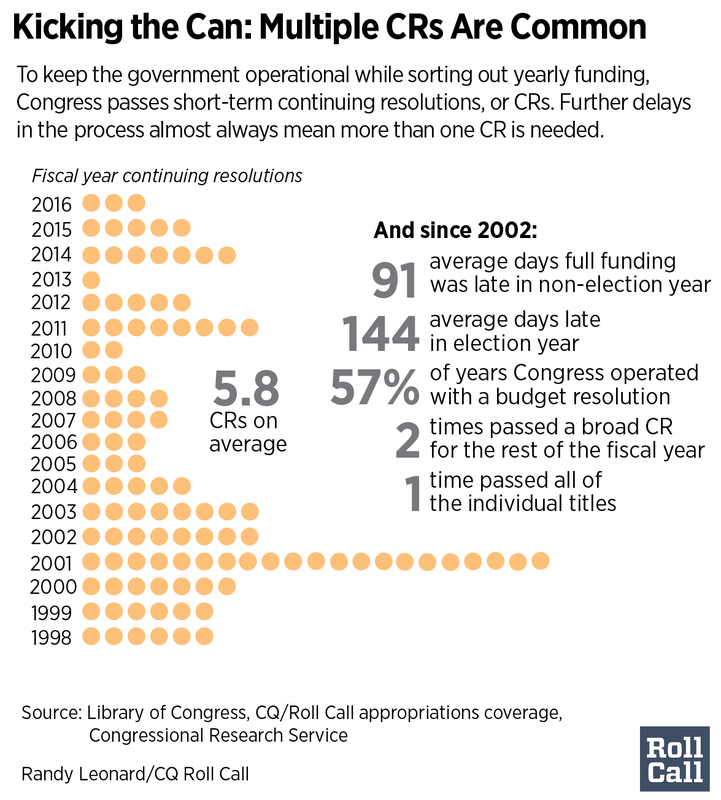 The last time not a single CR was needed was two decades ago, in 1996, because Congress had enacted every one of the regular spending bills by the start of the new fiscal year on Oct. 1. Without its annual spending measure, a department or agency loses the legal authority to obligate more money for nonemergency operations after Sept. 30 of each year. So a CR takes its name from the fact that, unless the measure becomes law, many federal programs may not maintain “continuing” operations because they have run out of appropriated money. Also, a CR is technically a “joint resolution,” which is normally used for short-term alterations in law, instead of a bill, which is customarily for longer-lasting policy changes — although in almost every respect the two move identically through the legislative process. The three central decisions Congress must make when writing every CR are how long to keep the spigot open, at what rate to keep the cash flowing, and which (if any) agencies should be treated more (or less) generously than the rest. There’s been very little consistency in the outcomes since the last on-time completion of the annual budget process. Video originally published October 19, 2015. Since the fall of 1997, there have been measures that kept the government running in place for as short as one day at a time and for as long as 32 weeks. The Congressional Research Service calculates that the average duration of all 106 CRs in those years was 25 days. The process has been completed no less than three weeks behind schedule, and the average finish has been about 100 days beyond the legal deadline. A Roll Call analysis found that Congress passed an average of 5.8 CRs each year. The level of spending is also up for debate. Most times, the CR allows government offices to keep writing checks at the current rate, based on the total appropriation for the fiscal year that’s just ended. But sometimes, the agencies are instructed to start spending at a pace — whether it’s more or less than the status quo — that would be dictated by a House or Senate appropriations bill that’s in the pipeline but not yet finished. And other times, Congress dictates an across-the-board spending reduction (a “haircut,” in congressional shorthand) for all the programs governed by the CR. Lawmakers sometimes give themselves an added degree of difficulty by attaching controversial legislative language to a CR, which is supposed to be the epitome of “must-pass legislation.” It’s when these measures actually don’t pass before deadline — either the end of the fiscal year or the expiration date of an earlier CR — that a partial government shutdown takes place. That last happened three years ago, when Republican efforts to use a CR to repeal the 2010 health care overhaul were rejected by Obama and congressional Democrats outright, and many nonessential government services were put in limbo for 16 days until the GOP relented and a CR lasting until January was cleared. How intensely such games of legislative chicken get played this month will go a long way toward deciding how many CRs — lasting how long, with how much in spending levels and with what anomalies — will be used to postpone a final resolution of the fiscal 2017 appropriations process.